The ink spilled for democratic studies have been very abundant especially after the fall of USSR. Journal of Democracy have been the advocate of democracy since its first publication back in 1991 when they made the introduction with the article “Democracy’s Third Wave” written by Samuel Huntington. In this study we go back to those days to 1990s when one of the world’s leading oligarchy -the system of apartheid- came to an end with the first free and fair elections in 1994 in South Africa. Qualitative data analysis method and content analysis technique are used in this study. Our case is chosen by following the purposive sampling method. Our study will focus on the impact of those days’ one of the most beloved president; President Nelson Mandela, who was one of the most influential leader that made transition to democracy for his country and for his people of South Africa. In addition, we will try to answer the questions of how Nelson Mandela defined democracy in his speeches in 1994 and what are the attributions that he made to democracy and democratic transition. The term democracy was used by people in the past to the present day to describe a certain form of government. This form is perceived by people as the ideal management style. The word “Democracy” comes from the Greek word demokratia; the rule (kratos) of the people (demos) (Crick, 2002). This is the perception of democracy inherited from Ancient times and in the modern time one of the leading democracy scholar defines democracy as follows: “A political system that is characterized by value system allowing the peaceful ‘play’ of power -the adherence by the ‘outs’ to decisions made by ‘ins’and recognition by ‘ins’ of the rights of the ‘outs’- there can be stable democracy” (Lipset, 1959, p. 71). In democracies, leaders are elected, freedom of assembly, freedom of speech and expression, and the right to equal protection before the law are guaranteed (Dahl, 1974).Citizens in a democracy enjoy the right to join organizations of their choice that are independent of government and to participate freely in the public life of their society. Now, let us proceed with the background information that triggered the democratic transition in South Africa. For many years South Africa was colonized by the Europeans: first the Dutch and then the British. Discrimination in South Africa has existed from the past. The African National Congress was established in 1912 in response to the pressures, sanctions and discriminations imposed on blacks by whites. The concept of Apartheid was a racist discrimination system, which was applied by National Party government in South Africa between 1948 and 1994. Apartheid, after the general election in 1948, proceeded to be formalized. According to Apartheid system, people classified by skin color. Outside of the white minority, black majority took less advantage of service of citizen. Nelson Mandela was a black fighting for equal rights. The African National Congress (ANC), which advocated for the rights and struggle of the indigenous people against whites, he participated for the first time at the age of 25, as activist in 1943. Later, he founded the ANC Youth League and assumed his presidency. By the 1950s racial discrimination began to take effect. Nelson Mandela began to take active role in African National Congress. Mandela, who advocates a more militant organization, has been arrested many times and was prohibited from participating in political activities. Mandela, along with 155 others were charged with treason by the white government. Four years later, the trial still did not prove that the people were guilty. In 1960, when the ANC was declared illegal, it had to hide with the other party members. Racial discrimination had begun to be felt more and more. In 1960, the Sharpeville massacre, in which 69 blacks were killed by the police, became a turning point. This event had also brought about the end of peaceful resistance. At that time, Mandela, the vice president of the ANC, launched an armed struggle against the military and government targets, and established the ANC’s armed wing. Later on, he was accused of trying to overthrow the government and try to provoke the people and was arrested and imprisoned. In the winter of 1964, Nelson Mandela was sentenced to life imprisonment at the age of 46. Although Mandela was in prison, Mandela came forward as a symbol of resistance. Hundreds of blacks were killed in the 1976 black movements. Due to ongoing pressures and killings, the UN Security Council forbade the sale of arms to the Republic of South Africa. Mandela’s former partner Tambo, in 1980, launched an international campaign to release Mandela. Niggers who did not have the right to vote in the September 1989 elections made a big strike across the country. President Klark, who had implemented a softening policy against the black, said in a speech he made during his parliamentary debate in February 1990 that the ban on the African National Council, the African Communist Party and 33 opposition organizations were lifted. The South African president, FW de Klerk, lifted the political ban on the ANC, Mandela was released and negotiations started in South Africa to establish a democracy representing all races. Mandela and ANC leaders announced that they were taking the armed struggle which was the hallmark of the struggle for equality, freedom and democracy. Democracy studies have been flourished with the start of Third Wave of Democratization. In his piece, Samuel Huntington explained external influence that leads democratization. For instance the fall of dictatorships in 1970s started the Third Wave and the fall of Berlin Wall facilitated this transformation. According to Huntington and many other, Lipset, Przeworski and Limongi democratic transition can well be maintained with a specific economic level. Furthermore, there are aspects of democracy which are deemed necessary for both transition and consolidation of democracy. Democratic paradigm has two different aspects: institutional and behavioral. In this part we will elaborate on these respective aspects. To start with institutional aspect, this refers to the main principles of democracy which are introduced by Robert Dahl in his one of the most influential work called “Polyarchy”. He emphasized seven different institutions for a state to be called polyarchy. For the sake of clarity we will use polyarchyand democracy interchangeably. So let us introduce these respective institutions. The first one is the government should consists of elected representatives and their role is defined by the constitution. The second one is the existence of free, fair and regular elections. The third one is the universal suffrage. The fourth one is the right to stand as a candidate for offices in the government by all citizens. The fifth one is freedom of expression. The sixth one is freedom of media. The last one is freedom of association. These procedures are called as “procedural minimum” by Dahl which reflects the need for application of these procedures in order to have functioning democracy at home. Procedural minimum is almost accepted by every democracy student. However, there are some scholars who add more to these procedures. Collier and Levistsky call this addition as “precising the definition of democracy”. Schmitter and Karl in their article “What democracy is… and is not?” introduced two more procedure’s to Dahl’s procedural minimum. These are as follows the sovereignty at home and abroad. Meaning, the government should act independently and it should act free from the domestic interference. For instance, if military intervenes in the affairs of the government and it has the power to shape the politics and the policies of the government then that state fall short of being a democracy. In addition the government should be accountable to the citizens not to outside powers. External powers should not interfere and shape the policies of the government. More had been written on this subject matter but to be precise let us proceed with the behavioral or attitudinal aspect of democracy. Alexis de Tocqueville, in his masterpiece Democracy in America underlined the best possible way for democracies to function well and efficiently. According to him democracies matter when the two aspects of democracy are combined. He emphasized that behavioral or attitudinal aspects of democracy are as important as institutional aspect. Almond and Verba named this aspect as “civic culture” and in their book called “The Civic Culture: Political Attitudes and Democracy in Five Nations” in which they evaluated democracy in five different nations: England, Germany, Italy, Mexico, and the United States. The study was based on analyzing the democratic history of those nations and whether democratic history had an impact on the democratic future of states. After receiving several criticisms the authors revisited their previous work in a separate book called “The Civic Culture Revisited” in which they strengthened their work by addressing the criticisms that were raised against the previous work. There are plenty of more scholars who spent their career on studying civic culture. In their book Putnam et al. explained the civisme in Italy starting from the 1200s up until 1990s. They explained the difference between the democratic performancesof Southern Italy and Northern Italy. According to their findings; Northern Italy were found to be more civic in the sense that they performed better in terms of egalitarianism, solidarity, trust, tolerance, associationalism, and civic engagement. According to authors, civic community was the basement of a democracy and which make it work. However, there are some critics of this view. In her article Berman opposed these neo-Tocquevillian arguments by stating that vigorous civil society was the reason behind the fall of Weimar Republic. She argued that both civil society and democratic institutions should be balanced so that the democracy may well function. In addition there is abundant work on democratization in the context of South Africa. Although, there is a gap on the influence of individual leader in democratization paradigm. To fulfill this gap we offer to study the speeches delivered by the first president of South Africa –Nelson Mandela- in 1994 since that was the year that the country truly abandoned the system of Apartheid. The method that we used will be explained in the following section. We used qualitative data analysis methodology. In addition to that, we used content analysis technique to analyze the speeches of Nelson Mandela. We chose to use directed content analysis technique. 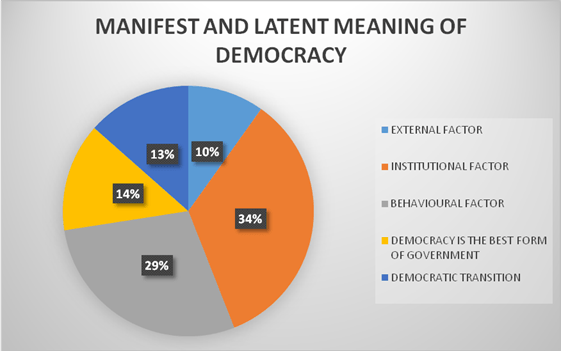 We derived our codes from the existing literature and we coded “democracy, democratization, institutional aspect of democracy, behavioral aspect of democracy, and external influence”. Hence, we found out that beside the literature Nelson Mandela himself associates democracy as a well-functioning regime, which is effective and efficient in terms of economy and he emphasized modernization in the making of democracy. There are some other codes that we have derived from the speeches hence, we will describe them in detail in the findings and discussion section. We also benefited from both manifest and latent content meanings. In our case selection, we used deductive approach in the sense that it was a top down approach. First of all, we focused on the effects of Third Wave of Democratization in the aftermath of the fall of USSR in the context of Africa. We found out that South Africa was one the most successful transition to democracy in the time frame that we were interested in. This was a purposive sampling. We even went further to analyze the speeches of Nelson Mandela since his paramount efforts for democratization remains let slide. The literature on democratization in the context of South Africa was mainly focused on country level or institutional level yet, robust influence of Nelson Mandela need to be emphasized. That is why we chose to analyze his speeches and we included them in our case selection. We analyzed whole speeches of Nelson Mandela throughout the year 1994 since in this year South Africans cast their votes for the first time in free and fair elections. April 27, 1994 was a hallmark for South Africans and the speeches of Nelson Mandela in this year had showed his perception of democracy and patterns of democratic transition in South Africa in the post-apartheid era. Our level of analysis is an individual one since we focused on the speeches delivered by Nelson Mandela the president himself but only limited to him.Whereas, our unit of analysis is individual paragraphs of his speeches in which we found the key words “democracy” and “democratization”. Now let us proceed with the findings and discussion section where we will express the manifest and latent meanings of the relevant paragraphs. We will also show how we derived our codes. The research aimed to describe the patterns of democratization in the speeches of Nelson Mandela. We reached our goal by using various coding for respective paragraphs in which the key words: “democracy and democratic” were found. Our codes are as follows: economic development, modernization, external influence, democratic transition. We also tried to find out the attributions of democracy in the speeches of democracy. There are two different codes for that purpose: institutional and behavioral aspect of democracy. The codes are derived from the existing literature however, there are some particular attributions that Nelson Mandela attached to democracy. For instance, Nelson Mandela pursueddemocracy as the best form of government. He tried to emphasize his perception in almostevery speechthat he addressed democracy. According to our finding, Nelson Mandela stated the word democracy and democratic in total 257 times in his speeches delivered in 1994. Below one may find the distribution of those words in respective months. Table 1: Distribution of reference to the words: democracy and democratic. As a result of our analysis, there are five varies codes that dominate the speeches. These are: external influence, institutional aspect of democracy, behavioral aspect of democracy, democracy as the best form of government, and democratic transition. These are derived from the manifest and latent meanings of the speeches. For instance, external influence refers to the speeches that made in international settings as well as when the speeches addressed international community. In his speeches Nelson Mandela referred to external influence in three different ways: when he expected support from the Western powers, when he stated his hopes for being a good example for the region to guide their way to democratic transition and lately the security forcesof Mozambique had provided the security service for the protection of elections. On that note, there was one striking statement that when he dedicated the role of protecting democracy to military and the police. He also underlined that their role was such a holy one. Institutional aspect of democracy was the most frequent one especially, political rights such as: elections, representation, universal suffrage, and right to form association were very noteworthy. Furthermore, his institutional conceptualization of democracy is much closer to Schmitter and Karl rather than Dahl since he includes sovereignty at home and abroad. Meaning that the government offices will be free of interference by both external and internal powers. However, there were contrary points with Karl and Schmitter with reference to the functioning of democracy. According to Nelson Mandela democracy is the most legitimate, effective, stable and prosperous form of government. Even though, he is aware of the fact that democracy takes time and it brings challenges, he still kept his hopes for democracy at home and abroad. Behavioral aspect of democracy was almost all the time referred with the institutional aspect. According to him, democratic transition and democratic consolidation would be possible with the combination of these two aspects. Another important point is that Mandela pursues democracy as the form of government that satisfies the majority of people. In order to achieve that aim he manifested this view in his several gatherings with different opposition groups and he asked their support and coalition. He also valued the protection of minority rights and he pursued them as part of the society and didn’t exclude them as the former regime would do. Lastly, democratic transition was associated with the economic well-being of the society, modernization, improvement on education and health services as well as equality of fellow men and women. In that respect he emphasized democratic norms and values and he encouraged South Africans to respect and adapt the culture of democracy. Figure 1: Showing the percentages of main codes derived from the speeches. The existing literature on democratization mainly focuses on comparative approach as well as country level analysis. However, we purposely chose to conduct our study based on individual level of analysis. We hope that our study will be filling the gap in the literature in that sense. Moreover, we wanted to honor the soul of Mandela due to his paramount efforts to make democratic transition in South Africa. On the contrary, we definitely had challenges. For instance, some of the coding are very much related to one another so that to distinguish between them was a hardship that we faced in general. In addition, we acknowledge that our study reflects only a limited timeframe as well as limited to the speeches of Nelson Mandela. So that to reach generalizations out of our study is not something that we aimed to achieve in the first place. Furthermore, we had to drop some units due to the fact that both latent and manifest meaning didn’t relate to our research question. We also know that our study does not reflect the causations. For instance, we provided data on our coding and we tried to show the patterns of democracy and democratization in the speeches. However, we do not know why Nelson Mandela pursues democracy or democratization in the way we evaluated and indicated. Polity. (2014). Polity represents a wide range of information on the period, academics gather information about the regime types of different states. The World Bank. (2014). The World Bank provides a wide range of information on the period, specialists gather information about the different political, social, and economic aspects of life from different countries. V- dem: (1994-99). Varieties of democracy is a database that provides historical data on democratic situation of the countries.